Skiing the Dolomites of Italy is vast, and Val Gardena offers some of the best family ski terrain with a beautiful historic ski village at the base. Val Gardena (or Gröden in German) is the Rose Garden of the Dolomites, and in winter it is a white rose inviting skiers. All around the beautifully prepared pistes, lots of snowmaking here, are the towering Dolomite peaks as your ski view. Val Gardena is part of the Dolomite Superski Region of 1,200 kilometers if trails and 450 lifts in 12 ski areas. Val Gardena’s 79 lifts cover about eight unique mountain areas, a mix of modern gondolas, chairlifts and pomas. The Dolomiti ski trail maps are confusing since lifts from the villages head up in all directions, from Ortisei, Selva and St Christina. There is World Cup skiing on Ciampinoi and long beautiful slopes of Saslong all the way to Wolkenstein/Selva, to well-groomed pitches of Col Raiser. The ski slopes of Passo Sella (Sellajoch in German) are part of the Sellaronda 42 kilometer circuit of the Dolomites, so some lifts are busy during peak times and holidays. Kids will enjoy the snow parks and skiing through the ice caves at Sotsaslong. Val Gardena’s Alpe De Siusi, also called Seiser Alm, is ideal for beginners and intermediates, a completely separate ski. A long gondola from Ortisei takes you up Mont Seuc to snowy valleys of a high alpine plateau – the largest plateau in Europe. Meandering gentle terrain that stretches out in every direction. Alpine skiers coast next to Nordic skiers, and winter hikers walking along some of the same trails as skiers and snowboarders. Alpe de Siusi is a giant rolling plateau – it would be a snooze for expert skiers, Alpe de Siusi – Alps de snoozy, as there is not much vertical or pitch here. Although on a powder day, you might find some low angle powder since the beginners and intermediates stick to the prepared piste. If you are learning to ski, the ski school at Alpe De Siusi is huge, handling groups of kids and snowplowing adult skiers. There’s a Seiser Ski Tour to cover the entire region in a circuit, like the Sellaronda for beginners. 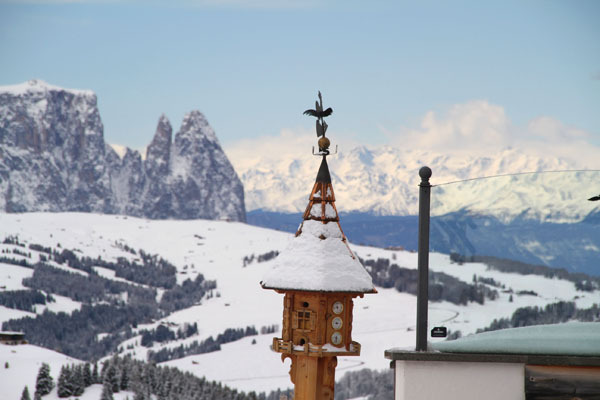 Seiser Alm does have many charming ski huts and restaurants you can ski to, and several hotels on the high alpine area. Val Gardena has 44 mountain chalets serving Tyrolean lunches, beer and prosecco aperol sprtiz, and pumping out music on their large terraces on brilliant sunny days. The culture in Val Gardena is south Tyrolean, with Austrian German being the primary language but most everyone speaks English – and Italian. The village of Ortisei is the best place to stay in Val Gardena. Church steeples and the clock tower provide history, while a pleasant pedestrian zone of interesting shops and cafes is ideal for strolling après ski. The best place to stay in Val Gardena is the historic Hotel Adler, an 1810 yellow castle in the heart of the village. Families are welcome here, and the Water World of pools and spas is heaven after a big day of skiing. Hotel Adler’s rooms and suites are 5-star, as is Hotel Adler’s service and dining. A family ski trip to The Dolomites should include skiing Alta Badia, Arabba/Marmolada, and even a day at Kronplatz and Plose – which are on the Dolomite Super Ski Region lift ticket. You can also visit the beautiful Olympic ski village of Cortina.